Herald Corp., publisher of The Korea Herald and The Herald Business, celebrated the 60th anniversary of its foundation with a reception and special lectures on Monday in the presence of a large number of guests, the management and employees. President Park Geun-hye sent a congratulatory message for the anniversary and also the beginning of Herald Design Week 2013, which started Monday. Noting Herald’s bid for another era of growth under the motto of “Re-imagine,” Park wished for Herald Design Week to develop into one of the nation’s flagship festivals on design. 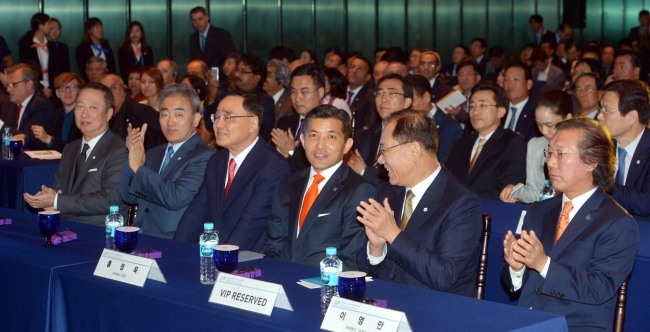 Prime Minister Chung Hong-won was among the guests of honor. Other guests from the government and the National Assembly included Minister of Culture, Sports and Tourism Yoo Jin-ryong; Vice Foreign Minister Cho Tae-yul; Park Joon-woo, senior secretary to the president for political affairs; Choi Hyung-du, secretary to the president for public relations planning; Rep. Hwang Woo-yea, leader of the ruling Saenuri Party; and Kim Kwan-young, senior spokesman of the main opposition Democratic Party. About 20 foreign envoys also attended the event. They included British Ambassador Scott Wightman; Paraguayan Ambassador Ceferino Valdez, who is acting dean of the diplomatic corps; and Afghan Ambassador Yunos Farman. Guests from the business sector also celebrated the anniversary. Among them were Korea Chamber of Commerce and Industry chairman Park Yong-maan; Shinhan Financial Group chairman Han Dong-woo; KB Nonghyup Financial Group chairman Yim Jong-yong; KB Kookmin Bank CEO Lee Kun-ho; Emily Cho, senior vice president of Jin Air and Rhee In-yong, president of Samsung Group Corporate Communications Team. As guests arrived at the reception lobby of Blue Square in Seoul for the ceremony, they were greeted by Herald Corp. chairman Jungwook Hong and other senior managers. A string quartet set the tone for the reception in the lobby, which was decorated with projections of the anniversary and Herald Design Week logo and a display of artwork to be auctioned for charity Tuesday. Guests and hosts mingled over refreshments in antechambers before the official ceremony kicked off at the adjacent event hall. They also perused framed copies of The Korea Herald, The Herald Business and The Junior Herald, displayed on the walls in an antechamber for VIP guests. He shared his thoughts on the legacy of Herald and his vision of its future. Chung made an address congratulating the 60th anniversary and also wishing for the successful Herald Design Week. “The past 60 years of the Herald can be said a record of the history of Korea’s success from the ruins of the Korean War. Taking the success as momentum, the government is exerting itself to revitalize our economy, create jobs and improve the livelihood of the people,” Chung said. “In achieving the goals, the role of news media as a channel of healthy criticism and advice cannot be emphasized too much. Three reputed innovators then took to the podium to give special lectures. Fraser Doherty, 24-year-old CEO of the international fruit jam company “SuperJam,” shared the stories behind the success of his childhood start-up using his grandmother’s jam. Doherty made the top 10 in the Times Young Power list in 2011. Don Tae Lee, a Korean native co-CEO of London-based tangerine direction & design, expounded three creation strategies ― creation through a harmony of insight and foresight; immersion in details; and partnership. He also stressed the importance of casting off familiarity, among others. Tim Brown, chief executive of IDEO, a design innovation firm, spoke about the new role of design in creating changes and leading innovations in the fast-changing world. Following the lectures, the ceremony ended with the announcement of the schedule of Herald Design Week. The diamond jubilee was epochal for Herald Corp. Its business domain as an information-knowledge company has expanded from newspapers and magazines to television, online and mobile services, and customized education via nationwide English villages and language institutes. Now, its reach is well beyond news media. As a lifestyle firm, its fields have been diversified to eco-friendly foods, materials and design. Herald Corp. dates back 60 years to a four-page tabloid English-language daily, “The Korean Republic,” first published by The Korea Information Service in August 1953. The daily was renamed “The Korea Herald” in 1965. Korea Herald Inc. was renamed The Korea Herald and The Naeway Economic Daily Inc. in April 1989, which revived the Naeway Economic Daily in June, the same year. It was renamed Herald Media Inc., and The Naeway Economic Daily renamed The Herald Business in 2003 after Hong was appointed as the 20th CEO in 2002. He was appointed as chairman and the company took over Donga TV in October 2007. Herald Artday Inc. was established and Herald Professional Inc. was renamed Herald Edu Inc. in Sept. 2010. Lee Young-man took office as the current CEO-publisher in April 2012. Herald Ecochem Inc. was established in May 2012. In August the same year, Herald Media Inc. was renamed Herald Corp., which announced a new vision of “Re-imagine! Life beyond Media” and a new corporate identity. Under the new management vision, Herald Corp. took on such brand-new projects as eco-friendly manufacturing and supply of organic juice and produce. Most recently, it took a step further in lifestyle business, acquiring Cheonbo Natural Food or CBNF, the No. 1 organic goods provider in Korea, this month. With the takeover deal with CBNF, Herald is evolving into an environmentally friendly lifestyle brand beyond media and education businesses.